was able to get me out of a bind. Many of you have read about me being a dog trainer, and I must confess that ever since I took over this new occupation of real estate there have not been too many dogs getting trained. 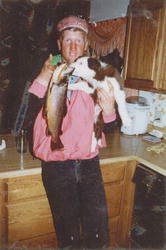 There was a time when I took much pride in the dogs that I had and how they performed on the ranch. Border Collies are the canine that I took a liking to and it came about from a very good friend of mine, Joe Miller, in Salmon Idaho. 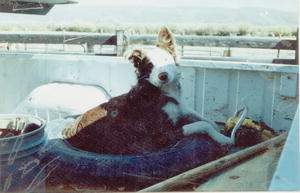 He and I were working together at Nelson Angus Ranch when he introduced me to real working dogs. He had made acquaintance with a legendary cow dog trainer by the name of Gary Erickson and since the afternoon I spent with Gary and his dogs I had a whole new outlook on man's greatest friend. I had to have one and so within a few months I had picked out Rowdy from a litter of six. 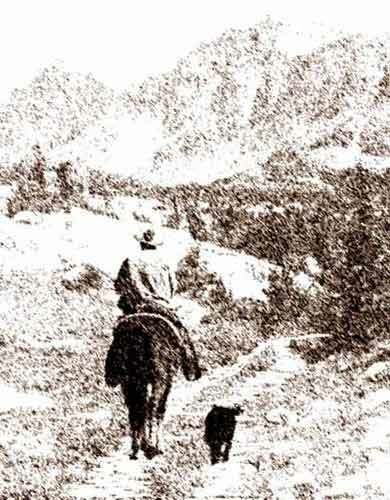 From that same litter came Joe's new dog named Ace and by the time the two dogs were a year old the horses at Nelson Angus Ranch were getting fat. In fact there was nothing the two of them could not do. From gathering pastures to working the alleys, they were certainly the best hands on the ranch. The sport of dog training became very exciting and the chance to attempt new obstacles was something we lived for. By the end of calving season I had moved back home to Pinedale and it was not long after that that old Rowdy turned up sick and passed away. This was certainly unexpected, and it was not only that I lost my best friend, but I also lost my right hand man. It only took a few weeks before I called Joe up on the phone in search of a replacement. A few months went by, long enough for Ace to find a pretty girl, and I was on my way back to Idaho to pick up a red and white little rascal that I named Ruff. By the time he was 6 months he had broken one leg from confronting a 2,000 pound bull, but by the time he was 9 months old the tables had turned. I still have the video of him handling the yearling bull pen all by himself at the age of 9 ½ months with only the instruction of my whistle. This dog was really going to be something. By the summer he was doing anything and everything and we were invited to attend the North American Stock Dog Handlers Championship trials in Idaho with a personal invitation from Gary Erickson. We were unable to make the trip but very honored at the invite. We continued to work on the ranch and made it to the trials at the local county fair just for the fun of it and to campaign Ruff for a few stud fees. It is fun to think back on the good times we had because as most of you know something always happens to the good ones and they seem to never be replaced. In the spring of 1999 Ruff was hit by a car and the best dog I have ever had was put to rest. He will always have a special place in my heart and it always brings a smile to my face when I see a Border Collie punch'n cows. On the lighter side of things, there is a story to share about Ruff when we lived on the ranch in Laramie. The story begins out in the corral where there was a water tank at the corner of 3 paddocks. Coming from cold country, every water tank has a heater and you usually leave it on until about the first week in June and usually turn it on again about the last week in August. Well, the water tank was getting a little mossy, I think from all the warm water, and needed a good cleaning, but neither Ruff nor I had the time to get it done. Since this was also the early years of the corral we still had to run a water hose over to the tank to fill it up when it got low. Usually this would be every other day or so. Well, it just so happened that it had been a couple of days and the water tank had not dropped an inch. The heifers were getting a little restless and they would walk up to the tank but would not drink. Most of them would just stand around and bawl as if to say "please clean out that dirty old tank so we can have some fresh water". After getting the point I went to the shop to pick up an open end adjustable to pull the plug and give it a good cleaning. Ruff was right at my side as I began to unroll the garden hose just like always. He impatiently trotted out in front knowing exactly where we were going and was sniffing around the base of the tank just as they do before marking their territory. As he lifted his leg there came the biggest yelp and scurry for cover you have ever seen. I have never seen a dog with his tail so far between his legs and in such a hurry to find a hole to crawl in. You guessed it. The heifers were not wanting to have clean water, rather bawling "could someone please come and replace this stock tank heater with one that doesn't bite so much". A short in the wiring had caused a serious amount of electricity to be sitting in the tank and it is amazing to this day that we did not lose a heifer from electrocution. There were more times than one that Ruff was able to get me out of a bind, and I am ever so grateful that the day we went to clean the water tank he beat me to it. You were a good boy Ruff, I really miss the days we spent "off the paved road".